Melissa Stockwell (www.melissastockwell.com): My last days in Beijing. My last days in Beijing. Tonight was closing ceremonies. 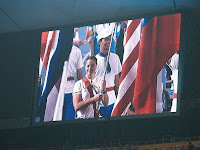 I was nominated to carry the flag for the US delegation and got the honor of doing so. It was such an honor, I can't even explain it in words. Standing in the tunnel with all the countries and walking out into the sold out stadium carrying our flag was amazing. It adds even more to the whole experience and was the perfect way to end the trip. Our team finished up in the water cube on top of the medal count. We got the most overall medals in the meet ahead of China and Ukraine. It was incredible, I only wish I could have added to the count. But being part of the Team has been the experience of a lifetime. I finally got to get around and see some of China. I went with my parents and a tour guide who showed us the sights. We went to the Great Wall and it was sooo cool. We took a gondola up most of the way and then walked the rest of the way up. What a sight to be on top of the wall. It was a for sure highlight of the trip. After the great wall we went to this back alley restaurant and got some Peking Duck. We walked in and saw the ducks roasting in the fire. The cook brought them over to our table and we got 4 plates of duck meet that we wrapped in these real thin pancakes with cucumbers. It was soo tasty. Then we had quite the experience at the silk market. It's this indoor mall with hundreds of stalls that have anything you can think of and you barter back and forth for the price you want. I got a few knock off purses and some jewlery. I enjoyed myself there. It was an overall great day being able to get out of the village and spend some time with my parents. We already had to pack our bags and turn them in for the flight tomorrow. We leave here at 12:30 for a 4:30 flight. As much as I am looking forward to getting home I am not looking forward to the long day of traveling tomorrow. From here to Chicago, to Denver, 2 hr. layover and then finally Colorado Springs. We will all be exhausted once we finally get back. I will be in the Springs for 4 days while I pack up and then make the drive back to Chicago. I can't wait to get back there. I doubt I'll be writing too much anymore once I get back. I will post pictures and post the website where you can go to see those. Thanks for all the cheers and the support from you all throughout this journey of mine. I wouldn't have gotten here without it. Hi Mellissa its Stacey Schwindt. I just got done reading your profile. I am so proud you of! Its just the start of something great! !